Google's "Phantom" Update Could Give Small Businesses an SEO Advantage. 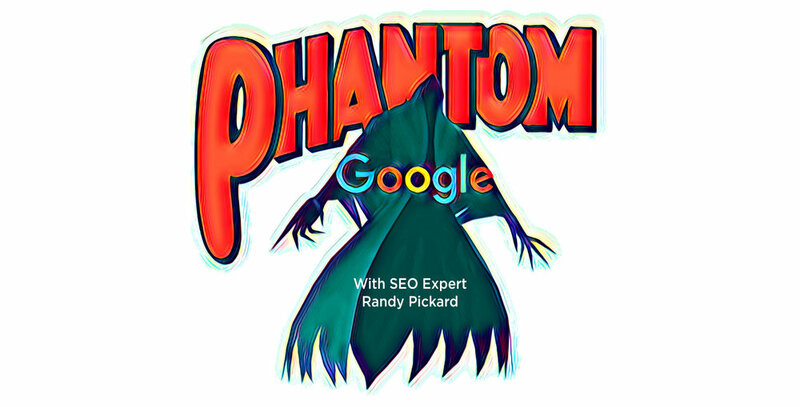 Last week, I got a call from an SEO partner, Randy Pickard where he expressed frustration at how a major Google update dubbed “Phantom” severely impacted his current SEO, but how that change may give small businesses an advantage. We immediately recorded a podcast interview and here’s what I learned. Randy Pickard is the Marketing Director at Mac Duggal (macduggal.com), and he’s been doing SEO since 1996. I started working with Randy almost 20 years ago when I helped him build landing pages for the internet real estate company Inest Realty. Google did a major change to their algorithm on March 12, and what made it particularly unusual is they actually announced it as a broad core algorithm. What they did, and what Randy has been saying in the past, is that if you're trying to get to the top of a Google search, content is king. With this new update content is even more important and now Randy’s saying, maybe content now emperor? In regard to the algorithm change Google made, there's a really positive aspect to it for a small to medium-sized business because as they've given more weight to content, link authority, or the number of links coming into you is less important. So, for a small to medium-sized business, if you're competing for the top of search engine page rankings with a large enterprise, it's much easier for a large enterprise to naturally attract backlinks. It's much more challenging for a small business to get links. While the value of backlinks is still a huge part of the algorithm at what ranks at the top, it's been devalued and content is more important. But very specifically there's a difference in the kind of content they're looking for. Previously a good search engine content strategy was to have the definitive information related to keywords, and a user's query. So let's say you had a website that was selling screws. The goal would be to have definitive information about screws. You might have everything about the components of screws, and you'd want to talk about the different kinds of screws. Now, Google's top of page results seems to be much more about solving user's queries. So that means the content should be much more focused on solving the problems that users have when they make a particular search query. So now, the best content strategy seems to be to define the project that your screws are appropriate for as opposed to just having detailed description of the type of screws. Here's an example that's really relevant to the website of a dress designer. In the past, a good content strategy was to include all the styles of dresses produced. The content was written with keyword rich content describing the styles, and dresses. There would be descriptions of mermaid dresses, off-the-shoulder dresses, ball gowns, et cetera. With this algorithm update, it seems that now the content should be focused on answering questions such as what type of dress compliments a specific complexion, or the style of the dress that is most figure-flattering. So whatever your product is, or your services, or whatever you're trying to get to the top for, you have to think of what is the query in Google, and searching for the best answer to that query. But what's really changed is they're now using artificial intelligence and machine learning to do a better job of A) understanding the user intent, and B) understanding that content. So that's the huge change. How can you give advice that will help the user searching for something? How can you help them solve that problem? Some tactical approaches a website owner can do. One of the things that we noticed as we were looking at sites, and this is a change that's happened fairly recently, is that Google still likes long content. A post that's 1500 words is still effective optimization to get to the top of the page. But what's really changed in the algorithm is as they're going more to indexing mobile sites versus desktop sites, it appears that having an advice focused blog is even more of a ranking factor. And the magic number for posts looks like it's about two per week or more. And then something else we've noticed is tabbed content. In the past when Google is looking at desktop sites, if they see tabbed content it would almost be as if that was hidden from the user, and it appeared as if Google devalued tabbed content. So while Google was indexing the tabbed content my hypothesis was that they didn't give as much value to tabbed content. And they've been saying for quite a while that when they switched over to indexing mobile because with mobile it makes sense to tab your content because you don't want to fill the screen with text, that they would start valuing tabbed content. And they've been saying that since last year. From what I'm seeing, they've only started doing that very recently. So all of a sudden tabbed content becomes very good SEO strategy whereas three, four months ago it wasn't. The Google algorithm is now specific to individual keyword queries. So Google, and with the massive amount of information they are capturing, discovers that a specific factor seems to lead to a positive visitor response to a query – it may be giving this factor more rank. People are speculating that even the engineers within Google don't really know everything that the algorithm is doing because it's machine learning for specific queries. Back to the dress designer. If you want to rank highly for the term mermaid prom dresses, you can have a page that doesn't mention the term mermaid prom dresses, but it's about prom dresses and dresses that flatter the figure. Google might decide this is the best answer for a query about mermaid prom dresses. So Google’s getting smart enough to know what you're asking for without you specifically asking. The Google algorithm isn't very good at interpreting images. What they can do is see how people are responding to pages that have images. But at this point, the Google algorithm is still best able to read text. So I would say text has become more important, and content in the context of providing a good user experience. So when you're building a website, I think the first thing you still want to do is look at a good user experience. You want to have pages that are attracting people – that people stay on – that they click through and stay for a long time, and then come back, and view your content again. But text is awfully important in content. Conclusion: What can a small business do tomorrow? My key piece of advice would be when you're building your website remember that content is either king or maybe now the emperor. And how does your website do the best job at responding to a specific query, that somebody is putting into the Google search engine. At Orbis, we’re helping small businesses with SEO by using audio driven content marketing. Get in touch with us and we’ll bring a creative team – an SEO expert, Photographer, Writer and Designer and build you a website in record time that ranks with easy to produce, ongoing content.